For some CTD casts, the up-welling PAR channel was considered to contain only null data and was subsequently deleted from these series during processing at BODC. Data were likely null due to sampling in low light levels (eg. dusk) or due to the sensor being removed from casts greater than 1000 m.
It was concluded after visual inspection at BODC that the altimetry channel did not contain data recorded from this sensor on the titanium CTD unit. The source of the channel was unclear. Since all other sensors were accounted for, the altimetry channel was considered ambiguous and surplus to use. Consequently, the channel was deleted from series obtained with the titanium CTD unit. Calibration of salinity on titanium CTD casts was achieved by comparison with the stainless steel CTD unit, which had been calibrated against independent bottle samples. However, as cast-pairs were only available for steel-titanium calibration comparison towards the end of the cruise, titanium salinity calibration should be treated with caution prior to station 16224A. 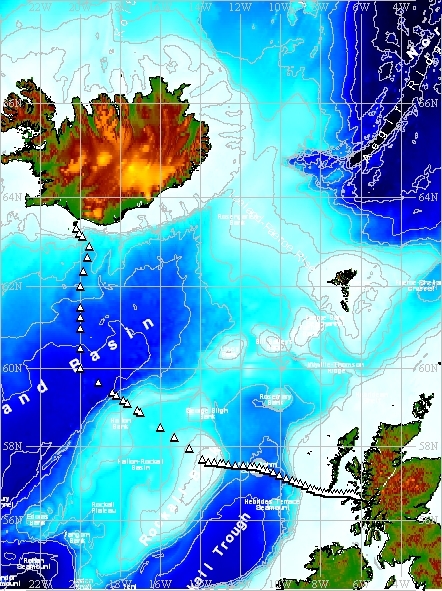 A total of 84 CTD stations1 were carried out during the cruise in the areas of the Extended Ellett Line and Icelandic Basin. From these, a total of 92 CTD downcast profiles of 2 decibar data were collected2, of which, 17 profiles were obtained using the instruments associated to the titanium CTD. Using this unit, a total of 5 profiles of data were collected as part of CTD survey 1 (C1), 2 as part of CTD survey 2 (C2), 4 as part of SeaSoar survey 1 (S1), 6 as part of SeaSoar survey 2 (S2) and 1 profile of data was collected in the area of the Extended Ellett Line. General information regarding CTD sampling strategy can be found in the cruise report from p137. Raw CTD files were initially processed through Sea-Bird software (SBEDataProcessing-Win32) using a modified protocol used during Discovery cruise D306. The resulting files were then processed through NOCS Unix scripts into PSTAR format using slightly modified versions of execs used on cruise D306. Separate NOCS Unix scripts were used for stainless steel unit casts and titanium unit casts. Full processing details can be found in the cruise report from p138.